We check over 450 stores daily and we last saw this product for £415 at Selfridges. Clean shapes and timeless femininity have definedChloé's success and passionate following for over six decades. 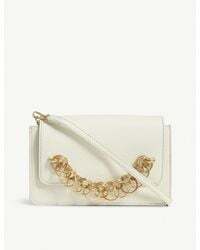 Juxtaposing the Drew Bijou clutch's curved leather body, a cascade of gold toned ringlets frame the embossed branding and act has a handle that reveals the split suede lined interior. Height 13cm, width 20cm, depth 3cm, strap drop 55cm)Chloé leather clutchMagnet closureGold toned ringlets, embossed branding, three compartments, interior card slotUse specialist cleanerHeight 13cm, width 20cm, depth 3cm, strap drop 55cmMade in Spain.